Muscular dystrophy is usually caused by a gene mutation and leads to progressive damage and the loss of muscle cells in your body. It includes over 150 types of degenerative muscle diseases acting in different ways, but almost all of them begin with some mild symptoms that, if left unnoticed, slowly progress with time. The loss of muscle cells usually causes a feeling of weakness in your muscles. So if you have problems when rising from a chair, brushing your hair, lifting an object, or dropping things on the floor, you probably suffer from muscular dystrophy. You may also notice contractures, reduced flexibility, and frequent muscle pain indicating that something’s wrong with your muscles. Along with that, symptoms such as prolonged spasms and the stiffening and tightness of arm and leg muscles may be signs of myotonia, a serious condition that requires medical treatment. Enlarged calf muscles may be one of the signs of Duchenne muscular dystrophy. This disease usually occurs at an early age in boys and worsens very quickly. 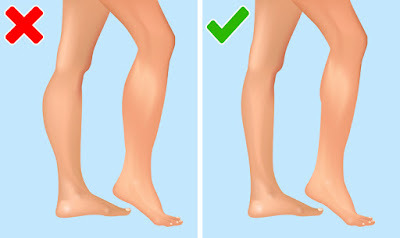 If you suffer from the Duchenne disorder, your calf muscles are often affected in the first place because they are used a lot when you try to stabilize your body. In this case, the original muscles eventually get replaced by fat and scar tissue. If your muscles are not strong enough to hold your spine straight, you may suffer from a poor posture that can lead to scoliosis with time. Due to this condition, your spine curves to either the left or the right side so that your internal organs change their position. Scoliosis usually presents itself in teenagers and it’s more often diagnosed in females than males. The disease may have many negative effects on your health including headaches and constant leg pain. In severe cases of scoliosis, progressive muscle weakness can affect your chest muscles associated with the process of breathing. Although you may not feel shortness of breath itself, you may experience some problems that indicate poor respiratory function like headaches, difficulty concentrating, and nightmares. Weak chest muscles make it difficult for you to cough, leading to an increased risk of a serious respiratory infection. So if not treated properly, a simple cold can quickly progress to pneumonia. Eating problems including the loss of the ability to chew food or to swallow it, coughing, choking, or a muffled voice after eating may be the first signs of Kennedy’s disease. This disease may present itself at any age, but it most commonly develops in middle adult life. Along with eating difficulties, you may experience some other symptoms such as changes in speech, a nasal voice, and even complete atrophy of facial, jaw, and tongue muscles. All of them require immediate medical treatment. In several forms of muscular dystrophy, progressive changes in the functioning of the heart may occur. These changes are called cardiomyopathy and you may have no symptoms of it at an early stage, although some people experience shortness of breath, tiredness, or leg swelling. However, due to this disorder, your heart muscle can’t work as perfectly as it’s supposed to work. That’s why you may acquire symptoms such as an irregular heartbeat, fainting, and dizziness with time. In addition to muscle wasting, people who have myotonic dystrophy often suffer from various eye problems. These problems include weakness in the eye muscles, weepy eyes, low eye pressure, and cataracts. A cataract is the most common sign of muscular dystrophy. It refers to a clouding of the lens inside your eye and typically leads to blurry vision, faded colors, trouble with bright lights, and night vision problems. Some men with myotonic dystrophy also go through hormonal changes. Such a hormonal imbalance typically causes early balding in the front part of a man’s scalp that often develops during their 20s or 30s. The endocrine disorder may also cause impotence and testicular atrophy in men. As a rule, this condition leads to infertility, or the inability to have children.